KMIC | Agile KM for me… and you? Been a while since I last properly ‘took stock’ of a specific topic in my knowledge garden. The last one about storytelling. But I’ve recently been working again on one of my pet topics: assessing knowledge work, so a good stock-taking exercise will be really handy for upcoming work, and hopefully for you too! In 2011, the US Agency for International Development (USAID) launched a KM impact challenge, inviting authors to submit entries explaining how KM could be effectively assessed. 45 different case studies were shared and reflected upon in a final report and a series of articles published in the Knowledge Management for Development Journal. These cases spanned a spectrum of KM interventions from capturing lessons, developing capacities, improving organisational performance, looking into learning events, impact of communities of practice etc. A lot of common challenges to assessing KM and practical recommendations and question to move forward are identified in this (to my knowledge) penultimate attempt at taking stock of assessing KM in development work. Read the KM Impact Challenge final report or discover the Knowledge Management for Development Journal issue dedicated to the KMIC experiences (limited access, come back to me for specific articles). I first came across this resource in a blog post (itself worthwhile reading) from Gerald Meinert about ‘KM asks for value compensation‘. Karl-Erik Sveiby is one of the KM tycoons. He has been writing a lot of really good conceptual and practical pieces on KM as a professor and as founder of Sveiby Knowledge Associates. Although this list of approaches to measure intangible assets is not strictly focusing on assessing KM, it is very useful to consider as KM relates very much to intangibles. 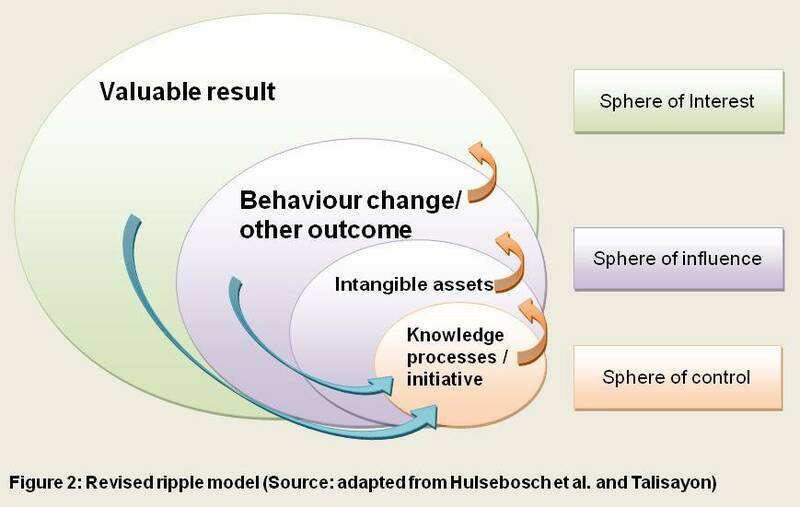 Sveiby looks at four different methods to measure intangibles: Direct intellectual capital methods, market capitalisation methods, return on assets methods and scorecard methods. He goes on looking into 42 different methods falling in either category. The merit of this work is to consider the valuation of knowledge capital in various ways. Perhaps not enough is said about how knowledge leads to other changes but that is covered by other methods and resources listed here. Nick Milton, of Knoco Stories, is a prolific blogger on KM and he totally should have been much higher on the top 100 KM influencers on Twitter. Among the many things that Nick has been blogging about are a series of quantified success stories – 60 to date while blogging here – which look at ways KM helped make or save money, adoption of new practices, increasing implementation speed, increasing effectiveness and benchmarking it against other comparies etc. Have a look at these Knoco Stories ‘quantified success stories‘. This is the latest I’ve come across. Compiled by Philipp Grunewald and Walter Mansfield on the back of a KM4Dev Innovation Fund grant, this survey report came together with a workshop report which consists in fact mainly of a list of 100 indicators to assess knowledge (management, sharing etc.). See the survey report or discover the top 100 indicators in the workshop report. Over time, various KM4Dev members have been asking about this perpetually reappearing conversation topic (and the reason why I consider M&E of KM one of the phoenixes of the KM field). Of all these discussions, ‘Monitoring and evaluating KM‘ and the more recent ‘Measuring knowledge sharing‘ are perhaps the most pertinent pointers, although other conversations helpfully addressed specific aspects related to e.g. after action reviews, partnerships, portals, conferences etc. There is another one of these conversations happening on the KM4Dev mailing list as we speak. Feel free to join and perhaps to help document the conversation, I may include it in this stock-taking post. The first paper takes stock of the major problems with assessing knowledge management in its various forms and how it is currently being done. The second paper suggests an alternative approach to doing it, inviting a variety of people that have a stake in the evaluation of KM and collectively reflecting with them on what assessing KM could be and how it would add more value. I have some more resources which I’d like to share with you from my Delicious bookmarks for your own sake. There must be many other key resources, reports and inputs and I would love to hear from you: What are your personal gems about assessing knowledge work? What resources and ideas have changed your view of this complex and uber-important aspect of our work in the field of KM? And here I don’t provide a meta-analysis of all these resources, but this might be the next step in my own perpetually restarting journey in the territory of KM. The other stock-taking posts and other posts in the M&E category.